Looking for that family get away or reunion? Want to just pack your clothes and go? Then have we got the place for you. Fully-equipped kitchens, fully furnished, and ready for you to enjoy. Located just outside of Franklin, North Carolina in the middle of the Smoky Mountains. Nestled on 60 undisturbed acres in Cowee Valley, you may encounter a few deer as well as lots of other wildlife. Its a place where you can enjoy the great outdoors, a warm cozy fire, a relaxing day on the porch, and a good nights rest. We have been in the vacation Cabin rental business since 2002 providing large 5-7 bedroom units perfect for extended family and multi-family vacations. This large home has all the conveniences of home. 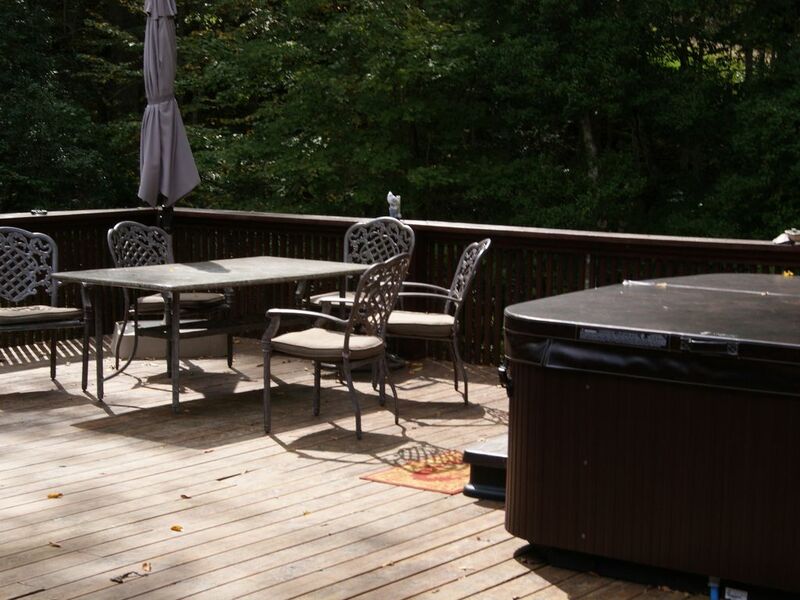 And maybe a few more, like a hot tub, pool table, swing set and a foosball table. We are on-site owners. Ever been to a vacation rental where the owner lives in another State and you've encountered a problem? Not at Bates Cabins. Should something not work, if you need additional supplies, or something as simple as figuring out how the TV remote is supposed to work, we live here on the premises and can take care of it immediately for you. No having to call the owner in another State and trying to figure it out over the phone. We make ourselves available 24/7 for any situation that might arise. 2 large living rooms. One on the main level and another downstairs. Satellite TV in both. Everything you need to cook even the largest meal. Additional folding tables and chairs available on request. reasonable size yard with a swingset.